We offer fine custom frames of enduring style and superior craftsmanship. We offer beautiful frames of all styles and types. Our offerings include Larson Juhl, Omega, and American Forest, just to name a few. 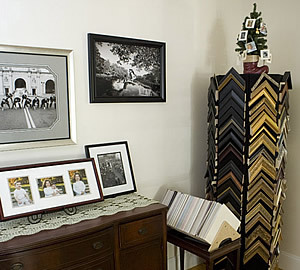 You may choose a custom collage of framed images, a large wall sized canvas framed, or a simply framed portrait. Each month we present a promotional frame offering for your consideration. Please make an appointment to come in to our Boston area studio and view our selections.